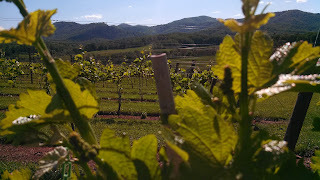 It seems we spend quite a few Mother's days in Charlottesville and this year we continued the trend by visiting a few wineries and breweries within the Monticello Wine Trail. On Sunday we stopped off at Michael Shap's Virginia Wineworks in order to stock up on their excellent boxed wine - yes boxed wine - made from 100% Virginia fruit. One box holds the equivalent of 4 750ml bottles and cost between $35-$40. In addition to the traditional Chardonnay, Viognier, and Cabernet Franc boxes, the winery has now boxed a White & Red Blend as well as a Rose - made from the bleed from the Michael Shap's. brand Cabernet Franc, Petit Verdot and Merlot grapes. The White Blend consists of Traminette, Vidal, Riesling, Viognier, & Petit Manseng whereas the Red Blend is comprised of Merlot, Petit Verdot, Tannat, and Malbec. Being on a schedule, we didn't even get to the Michael Shaps branded wines but were all too happy bringing home a couple boxes. But while browsing the barrels in the tasting room we noticed a few for Pippin Hill Farm & Vineyards. We knew that Shaps is their winemaker, one among many for Shaps, and remembered that they winery hosts a full service kitchen. No need to head all the back to town; instead we became one of dozens of families who made Pippin Hill their Mother's day destination. 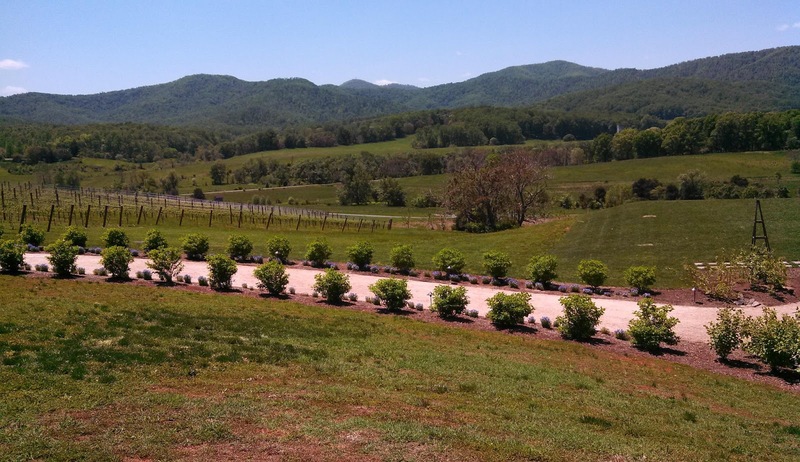 The winery is located outside of North Garden right off Route 29, south of Charlottesville and we navigated to the winery using the new Compass mobile app. Upon arriving we realized why the parking lot was full. The view of Castle Rock and Mill Mountain are spectacular - can't believe I left the HD video camera at home. And even though the winery was crowded, the Andrews run an efficient operation. There was never a wait at any of the tasting bars and we only had a slight wait to have a large party seated in the dining area. And we used that time efficiently by sampling several of their wines. The Pippin Hill Farm Blanc de Blanc was a favorite as was the Winemaker's Select White, Viognier, and Chardonnay Reserve. The Select White was similar blend as the White box above and the Chardonnay Reserve was my favorite white as it only exhibited a touch of oak treatment. For reds, I enjoyed the Winemaker's Select Red, an easy drinking wine that includes Merlot and Chambourcin. The single varietals were solid with the Cabernet Franc being my preferred red. 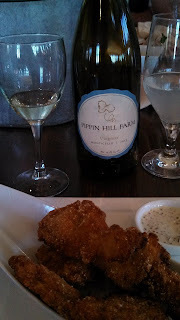 During lunch, we feasted on sliders, prawns, cheese plates, and later Chesapeake oysters and caramel popcorn - all washed down with Viognier and the Winemaker's Select White. Having a sustainable mindset, the winery sources from local and regional farmers and Chef Amalia Scatena's team created small, but filling entrees. 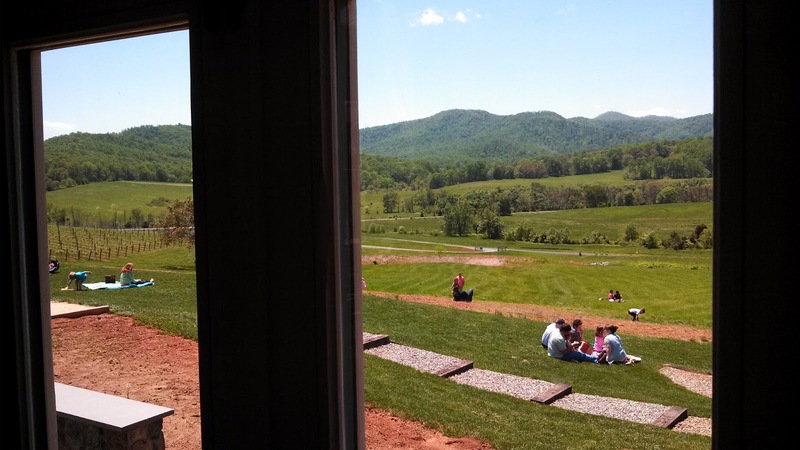 A pretty awesome day - and according to the harshest critic - her new favorite Virginia winery. Cheers.